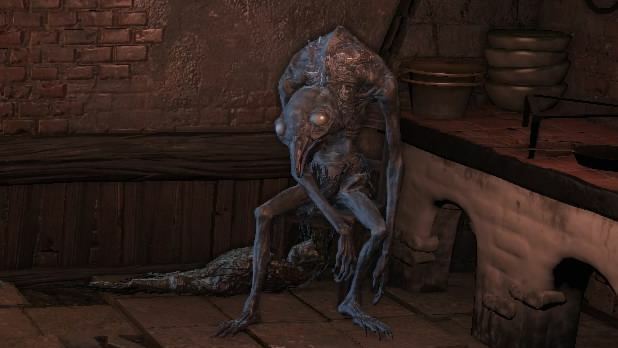 Corvo Colono è un NPC di Dark Soul 3. Il Corvo Colono può essere trovato nel Mondo Dipinto di Ariandel, nella prima casa che incontrerete arrivando al villaggio, in un angolo. Assomiglia ai nemici corvi che infestano l'area, attenzione a non attaccarlo. Dopo aver ucciso Sorella Friede, si trasferisce all'esterno della casa. Dopo aver ucciso Sorella Friede, parlate con lui fuori dalla sua casa per ricevere una Lastra di Titanite. "Hmm, well, there's nothing forlorn about you. You must be the other Ash, I suppose? I am Ash: Ohh, ohh, finally, you've come! Oh wondrous Ash, grant us our wish. Make the tales true, and burn this world away. My Lady must see flame, and you have only to show her. You are Ash, are you not? Is it not fire that you seek? Surely you've seen the rot that afflicts this world. But that witch fooled the good Father, and buried the flame. After we had all made up our minds, too. So, please, grant us one wish. My Lady must see flame, and you have only to show her." "I can hear the crackling from here. "When the world rots, we set it afire. For the sake of the next world. It's the one thing we do right, unlike those fools on the outside." "Yes, of coure, as a burner of worlds should...Set fire to the rot..."